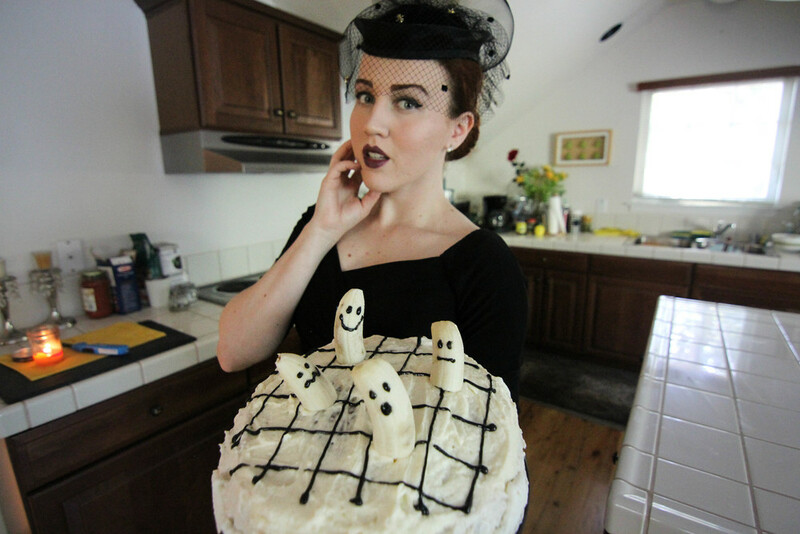 Here we are on the week of Halloween! I wasn’t the best at getting things posted this month unfortunately (& it’s my favorite month! ), but alas I do have this one! 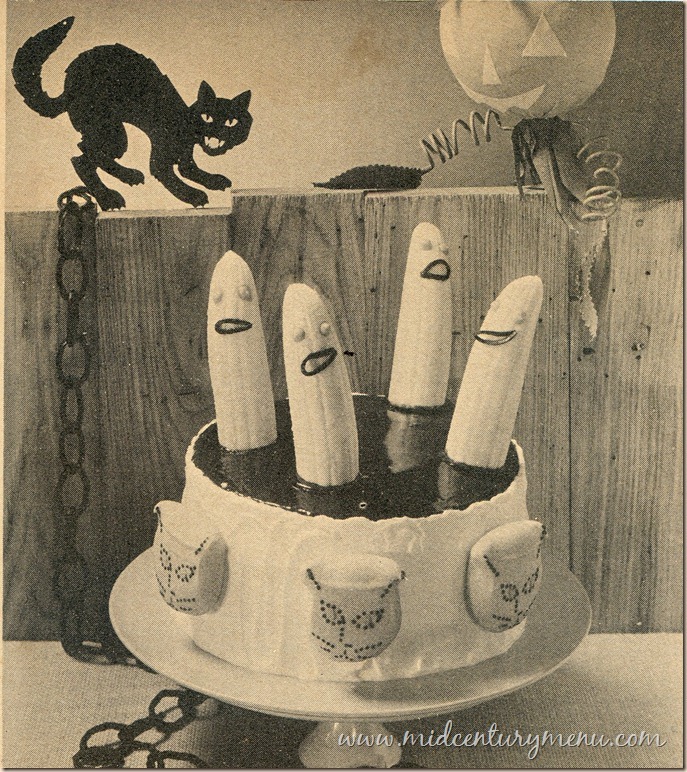 So this recipe I found digging through the archives of google searching for “retro halloween recipes” & behold this one popped up! It even led me to this amazing retro site call Mid Century Menu. There’s a National Banana Association! Who knew! 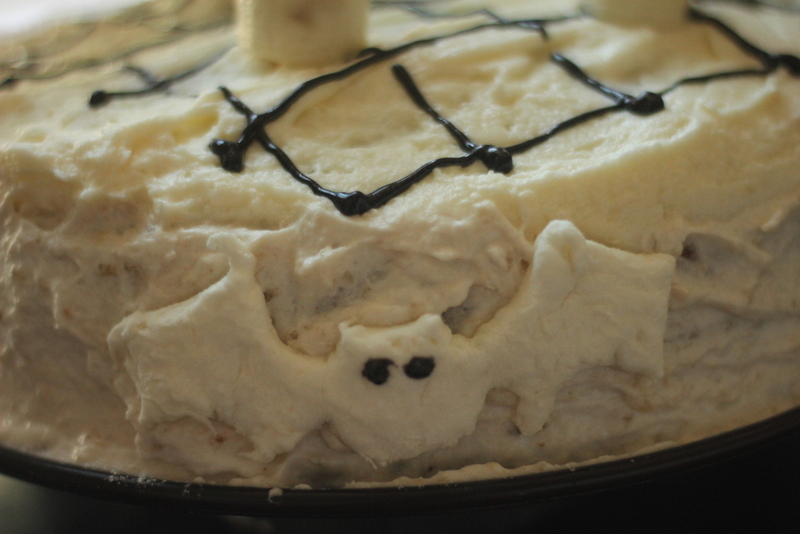 Now, I made this cake on 3 separate times. So here’s a quick over view on things I learned about this recipe & myself. 1.) There are no cat marshmallows. * Buy a bag of marshmallows & melt them in the microwave. Spoon that out onto a floured flat surface & let cool. Use a cookie cutter & cut those littler suckers out – in any shape your heart desires! 2.) 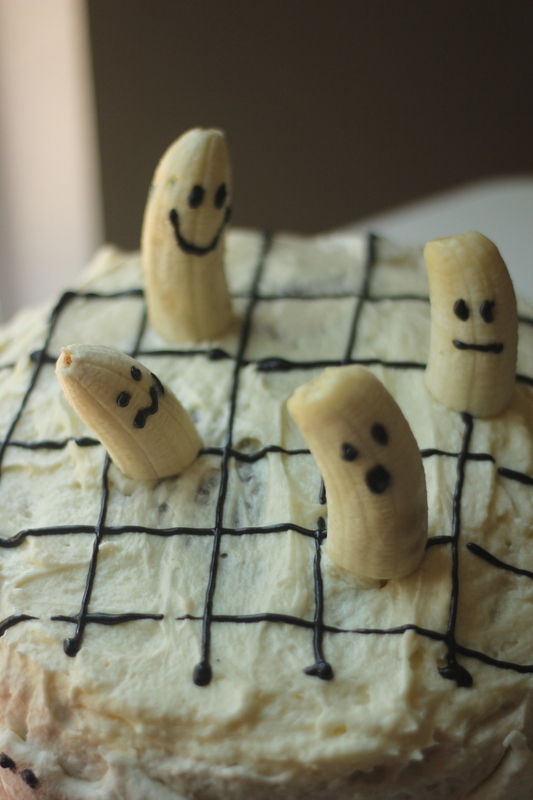 Get yellow, yellow, yellow bananas. The mushier the better. Obviously. OR use a food processor like I did to get it down to that nice mushy consistency. 3.) 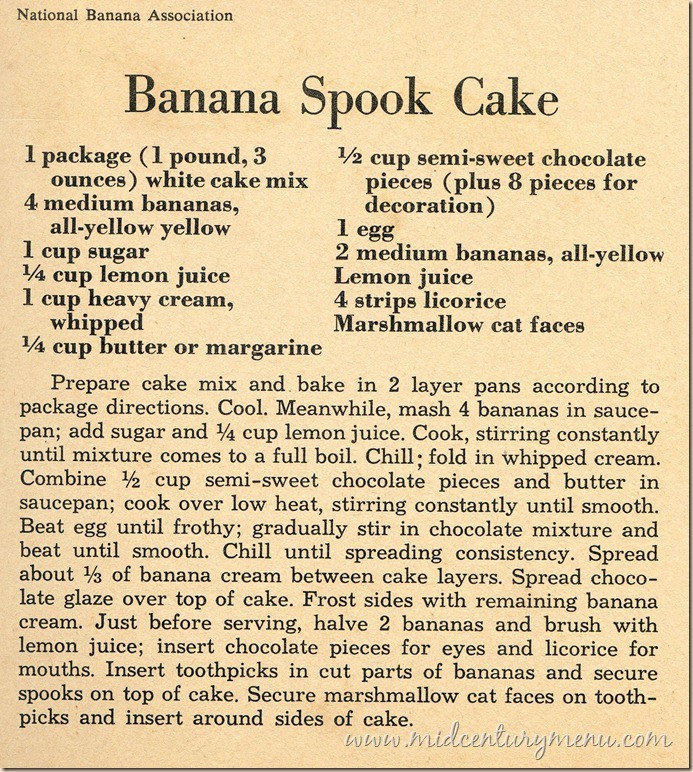 Fold in the chilled banana puree into the whipped cream. That way your frosting stays light & fluffy. 4.) I’m allergic to milk chocolate/dark chocolate so I tried to make a white chocolate ganache, it didn’t work the best (but after a couple time battling the chocolate monster I gave up & made a butter cream which is what I put on top). 5.) If you don’t like licorice, you can use the little squeeze tubes of black icing. Your welcome. 6.) I need practice with cakes! It’s been too long! Make sure butter is room temperature. Mix butter & sugar for 3 minutes making sure everything is combined. Add in vanilla & whipping cream & mix another minute. 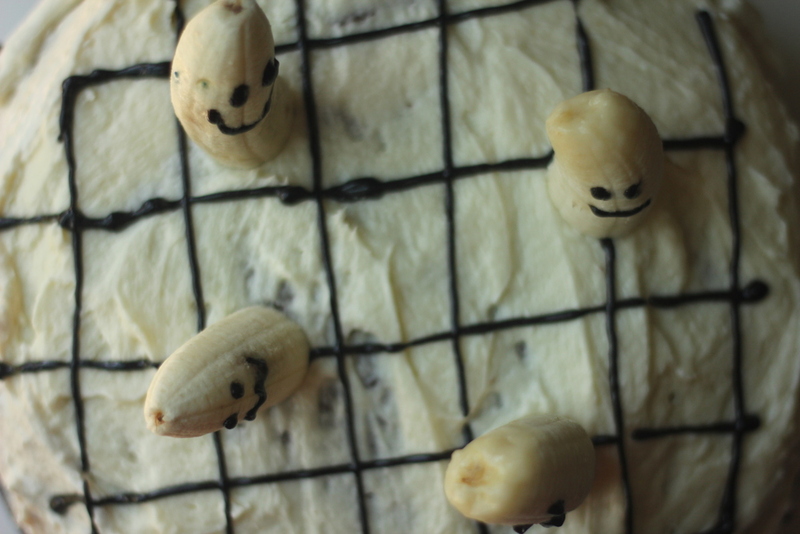 Look at those little banana faces though! Aren’t they just the cutest! I’m not a big fan of banana’s, as anyone who is a regular on this site knows, but it wasn’t horrible! It may not be something I would choose at a buffet, but if that’s all the sweet sugary goodness they have, I’d eat it! 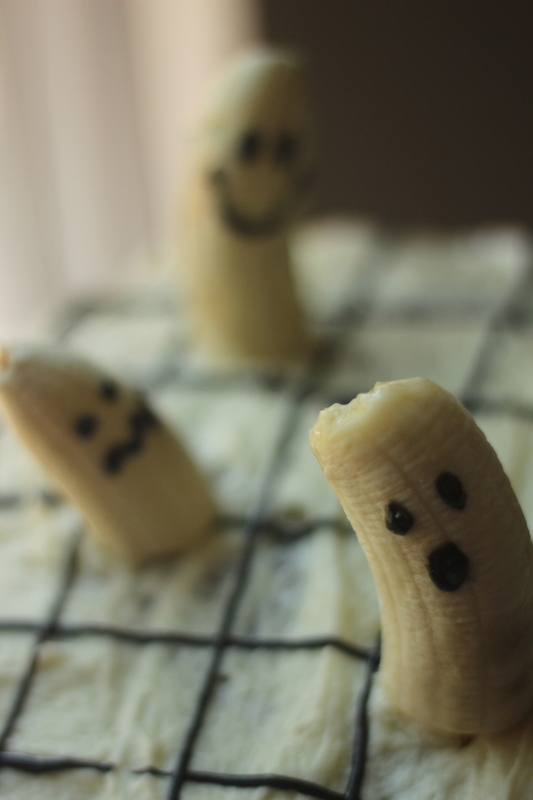 I know, I said no more banana's, but it was just too cute (& spooky)!